P-glycoprotein, blood-brain barrier, transporters, structure transport relationships, SAR, drug discovery. During the drug discovery process an average of five to ten thousand compounds are evaluated to identify the small subset of structures with appropriate properties to become a drug. 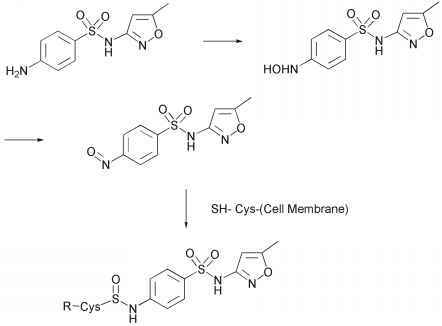 A potential drug is distinguished from a potent agonist /antagonist based on multiple factors affecting safety, exposure and marketability including target selectivity, chemical stability, physical chemical properties, and drug metabolism properties. From the drug metabolism standpoint unfavorable pharmacokinetics is one of the primary barriers to overcome in drug discovery. In the case of most CNS drugs, this is further complicated by the requirement for the compound to traverse the blood-brain barrier in order for it to be efficacious. Thus, for CNS drugs, a compound must balance chemical properties conferring good CNS penetration, favorable metabolic characteristics, and good oral absorption in addition to high potency against the target activity. Historically the properties defining pharmacokinetic parameters were largely attributed to passive processes defined by the physical chemical properties of drugs and susceptibility of drugs to phase I and II metabolism enzymes. More recently drug uptake and efflux transporters have been shown to mediate transport of a large variety of drugs raising interest in the role of drug transporters in the distribution, elimination and metabolism of drugs and their metabolites. Numerous transporters have been identified with potential to mediate uptake and elimination processes in the intestine, liver, kidney and at the blood-brain barrier. While it is clear that transporters can influence major pathways regulating drug disposition, our current understanding of roles of specific transporters in drug disposition is limited to examples with isolated compounds. This is in part due to the overlapping substrate specificity for different transporters, and scarcity of specific substrates, inhibitors and biological models for studying the roles of specific transporters in vivo. One exception to this is the multi-drug resistance transporter P-glycoprotein (Pgp) which has been shown to influence the pharma-cokinetics and pharmacodynamics of several drugs. This is particularly true in the case of CNS drugs in which Pgp has been shown to attenuate transport across the BBB, thus limiting CNS exposure. Much of the current understanding of Pgp has been fueled by the initial observation that overexpression of Pgp in tumor cells was associated with the development of multidrug resistance in tumors. In this mode, Pgp was identified as an efflux pump capable of transporting a wide variety of chemotherapeutic agents out of the cytosilic compartment of cells into the extracellular space. Initially Pgp was viewed solely in view of the consequences of its aberrant expression in tumor cells (Juliano and Ling, 1976; Roninson et al., 1986) but has since been shown to be constitutively expressed on normal cells in the intestine, kidney, liver, brain microvascular endothelia, placenta, adrenal cortex, testis, uterus, lymphocytes and hematopoietic cells (Cordon-Cardo et al., 1990; Thiebaut et al., 1989) where it is believed to afford protection from xenobiotics. The protective role of Pgp was most dramatically highlighted by the studies comparing Pgp-deficient mice with Pgp competent mice (Jonker et al., 1999; Lankas et al., 1997; Lankas et al., 1998; Schinkel et al., 1994; Schinkel et al., 1995; Schinkel et al., 1996; Smit et al., 1999). Pgp-deficient mice survived and appeared normal in a controlled environment, but were found to be hypersensitive to the neurotoxic effects of the Pgp substrate Ivermectin. This hypersensitivity was found to correspond to increased penetration of Ivermectin from the blood into the brains of the Pgp-deficient mice. Similarly, Pgp deficient mice are more sensitive to teratogenic effects of some Pgp substrates and show increased bioavailability and decreased clearance of some Pgp substrates. 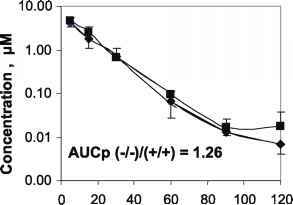 Thus, Pgp does not appear to play an essential role for survival and development of the mice in an unchallenged environment, but can dramatically influence the pharmacokinetics and pharma-codynamics of exogenous chemical agents. Pgp is a large (170 Kd) cell surface glycoprotein which like other members of the ABC family of transporters is organized into two transmembrane regions, each containing 6 membrane spanning a-helices (transmemebrane domains (TMDs)) , and two nucleotide binding domains (NBDs) (Ambudkar et al., 1999; Gatmaitan and Arias, 1993). The binding and transport of Pgp substrates is mediated by the TMDs using energy derived from hydrolysis of ATP which is catalyzed by the NBDs. The mechanism by which ATP hydrolysis is linked to transport of Pgp substrates is not well resolved but entails large conformational changes throughout the protein. These conformational changes have been detected using FTIR spectroscopy (Sonveaux et al., 1999), changes in immunoreactivity of Pgp (Mechetner et al., 1997), and susceptibility of Pgp to limited proteolysis (Wang et al., 1997; Wang et al., 1998). Four discrete conformation states have been detected which appear to correspond to different states of ATP binding and hydrolysis. Recently cryoelectron microscopy of two dimensional Pgp crystals has demonstrated major restructuring of the TMDs of Pgp upon binding of ATP (Rosenberg et al., 2001; Rosenberg et al., 2003). Although the large conforma-tional changes would suggest a tight association between ATP hydrolysis and drug transport, comparison of functional transport across cell monolayers and stimulation of Pgp-mediated ATP hydrolysis show significant disparity. In particular some compounds which are subject to significant transport by Pgp do not stimulate Pgp ATPase activity above its basal level, while other compounds which do not show significant Pgp-mediated transport, stimulate high rates of ATP hydrolysis (Polli et al., 2001; Scala et al., 1997). The initial site of substrate interaction with Pgp is not well resolved. The prevalent models for how Pgp transports substrates entail drugs partitioning into the inner (cytosolic) leaflet of the plasma membrane followed by binding of the substrate by Pgp in the plane of the membrane. Fluorescence resonance energy transfer studies on Pgp containing inside out plasma membrane vesicles demonstrated that the fluorescent Pgp substrate Hoechst 33342 is extracted from the inner leaflet of the bilayer (Shapiro and Ling, 1997). Since Hoechst 33342 fluorescence is low in an aqueous environment, the kinetics of the changes in Hoechst fluorescence further indicated that Hoechst was released directly into an aqueous compartment followed by a slow passive re-association with the outer leaflet of the bilayer. Taken together these results indicate that Pgp can extract compounds from the cytoplasmic leaflet of the bilayer and transport the compounds directly into the extracellular aqueous medium. Low resolution cryoelectron microscopy analysis of structure of Pgp is consistent with substrate interactions occuring within the plane of the membrane (Rosenberg, Velarde, Ford, Martin, Berridge, Kerr, Callaghan, Schmidlin, Wooding, Linton, and Higgins, 2001; Rosenberg, Kamis, Callaghan, Higgins, and Ford, 2003). In the state equivalent to the ATP bound form of the protein, Pgp shows a transient cleft within the plane of the membrane from which drugs can enter a pore to the extracellular space. 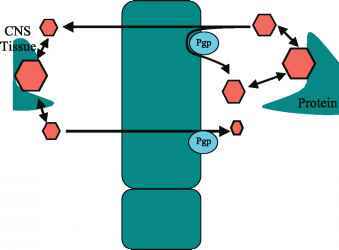 Images of Pgp equivalent to the nucleotide-free or the ADP-bound state suggest that the cleft closes after hydrolysis of ATP leaving the substrate in a channel that is open to the extracellular fluid. It is worth noting that the cleft in Pgp appears to extend through the length of the lipid bilayer up to the membrane cytosol interface. Consequently interactions with ampiphilic compounds could occur at the membrane-cytosol-interface, but it is unlikely that drugs would enter Pgp directly from the cytosol. Such interactions could account for Pgp efflux of relatively polar compounds such as cimetidine and polar metabolites which show poor transmembrane permeability (Hochman et al., 2001; Lentz et al., 2000). The site of interactions of Pgp with substrates has significant bearing on the chemical nature driving Pgp substrate interactions. Seelig (Seelig and Landwojtowicz, 2000) pointed out that given the hydrophobic nature of the environment surrounding the membrane partitioned drug, polar interactions may dominate recognition of substrates by Pgp since polar Pgp-substrate interactions would be distinct from the hydrophobic interactions occurring in the immediate lipid environment. Consistent with this premise Seelig and others have found hydrogen bonds, in particular hydrogen bond acceptors, to be important determinants for Pgp substrate interactions (Chiba et al., 1998; Ecker et al., 1999; Gombar et al., 2004; Osterberg and Norinder, 2000; Seelig, 1998). While our understanding of the mechanisms underlying substrate interactions and transport of substrates by Pgp is still in early stages, it is clear that these mechanisms are more elaborate than conventional models for enzyme substrate interactions. Attempts to derive meaningful interpretation of in vitro transport data must take into account these complexities including the involvement of membrane partitioning, a potentially large drug binding site, and potential for non-stoichiometric conformational link between ATP hydrolysis and drug transport. An understanding of these factors is essential in choosing and recognizing the limitations of model systems to evaluate Pgp mediated transport, and in establishing structural guidance to aid chemistry efforts to overcome Pgp as a barrier. The expression of Pgp in the intestine, liver, kidney and at the blood brain barrier is polarized in a manner consistent with a role in limiting absorption, and facilitating elimination of xenobiotics or in protecting sensitive CNS tissue from potentially toxic xenobiotics. In the intestine, liver and kidney Pgp acts to restrict or facilitate transport across a concentration gradient. In the intestine, Pgp activity transports drugs counter-current to the absorptive transport of drugs, thus posing a barrier to absorption of exogenous compounds (Gan et al., 1996; Hochman et al., 2000; Lown et al., 1997; Wacher et al., 1998). Pgp expression in the liver and kidneys is thought to function in aiding the elimination of drugs from the blood (Smit et al., 1998; Speeg et al., 1992). Studies in bile duct cannulated rats suggest that intestinal Pgp may also contribute to the systemic drug elimination (Mayer et al., 1996; Sparreboom et al., 1997). In absorption Pgp functions in a unidirectional manner restricting drug transport from the lumen of the intestine to the blood. Similarly, unidirectional transport by Pgp may predominate in drug elimination. Thus bidirectional transport ratios (basolateral to apical/ apical to basolateral transport) do not predict the impact of Pgp on these processes (Troutman and Thakker, 2003b; Troutman and Thakker, 2003a) because the effect in the absorptive and secretory direction is not always symmetrical. Pgp functions in the blood-brain barrier to restrict the distribution of compounds from the blood to the CNS (Lankas, Cartwright, and Umbenhauer, 1997; Schinkel, Smit, van Tellingen, Beijnen, Wagenaar, van Deemter, Mol, Van Der Valk, Robanus-Maandag, te Riele, and ., 1994; Schinkel, Wagenaar, Mol, and van Deemter, 1996). As apposed to unidirectional Pgp mediated transport being important in absorption and elimination, bidirectional transport by Pgp is important in restricting CNS distribution. Thus, lower steady state free drug concentrations in the brain result both from restricting the rate of transport of substrates from the blood to the brain, and efflux of drug from the CNS compartment into the blood. The influence of Pgp activity on minimizing brain exposure to drugs is much more pronounced than its influence on systemic drug exposure. Studies in Pgp deficient mice indicate that Pgp activity can reduce CNS exposure to a drug 10-100 fold, while having little influence on systemic drug exposure. This is illustrated in Tables 1 and 2 in which the impact of Pgp, as determined by comparing disposition of substrates in Pgp deficient and competent mice, is summarized for systemic and CNS exposure of orally and IV administered Pgp substrates. In contrast to the impact that Pgp has on the brain concentrations of substrates, plasma concentrations of Pgp substrates are for the most part relatively unaffected by the expression of Pgp. This would suggest that for many compounds Pgp has dramatic impact on CNS exposure of drugs, but has a very limited if any impact on their clearance or on the extent of intestinal absorption. Indeed many of our discovery compounds which show high Pgp transport have good oral bioavailability (Table 2), and show no significant differences in plasma clearance in Pgp deficient and competent mice (figure 1). Figure 1. Impact of Pgp on the (a) plasma and (b) brain concentrations of a Pgp substrate in mdr1a deficient (-/-) (^)and mdr1a competent (+/+) (♦) CF-1 mice following iv administration to the tail vein (3 mg/kg). Pgp had no impact on clearance of the drug as indicated by identical plasma AUCs, but resulted in 13 fold lower AUCs in the brains in Pgp competent mice. The compound administered in this study is a good substrate for mouse Pgp as indicated by high B to A/ A to B transport ratios in LLC-PK1 cells expressing mouse mdr1a. Table 1. Influence of Pgp on plasma and brain drug levels following oral administration. 'Data summarized from Kim et. al. J Clin. Invest. (1998) 101: 289-294; Schinkel et. al. J Clin. Invest. (1996) 97: 2517-2524; Mol Pharmacol (2001) 59: 806-813; Lankas et. al. Toxicol appl. pharmacol. (1997) 143: 357-365; Prueksaritanont et. al. (2002) Xenobiotica 32:207-20. Table 2. Influence of Pgp on oral absorption and brain drug levels following oral administration of a series of discovery compounds. Given the clear implications for CNS exposure but not systemic exposure, our Pgp studies in drug discovery tend to focus on improving CNS exposure. A model for the distribution of drug between the blood and the CNS is illustrated in figure 2. In the absence of active transport the unbound drug in the blood is equilibrated with unbound drug in the CNS tissue. Efflux by Pgp reduces the free drug concentration in the CNS relative to that in the blood. The total drug in each compartment is comprised of unbound drug and drug bound to plasma protein in the case of the blood, and drug bound to CNS tissue in the brain. Thus the ratio of the total drug concentrations in the brain and plasma can be significantly influenced by differences in the unbound fractions in the blood and CNS compartments. In addition to tissue/plasma protein binding and Pgp, drug concentrations in the brain can be influenced by the passive permeability of the drug, other efflux and uptake transporters, and ECF/CSF turnover. Given these complicating factors, interpretation of Pgp transport studies are focused on the impact of Pgp on CNS levels as apposed to predicting the absolute CNS drug concentrations. Figure 2. Representation of drug partitioning between the CNS and blood highlighting various components that can influence the distribution of drugs in both components. Drug (hexagon) is present in equilibrium between free and protein or tissue bound states. Free drug can diffuse by transcellular transport across the microvascular endothelial cells. Passive diffusion between endothelial cells is restricted by tight junctions. Pgp mediates transport of compounds from the brain to the blood and attenuates transport of compounds from the blood into the brain. To assess the role of Pgp in restricting CNS distribution, we integrate in vivo studies in Pgp deficient and competent mice with results from in vitro directional transport studies in LLC-PK1 cells expressing mouse and human Pgp. Through integrating the in vitro and in vivo assays we are able to establish quantitative correlations to predict the consequences of Pgp activity in man. Yamazaki et al. (Yamazaki et al., 2001) demonstrated that under controlled experimental conditions, in vitro transport ratios in mouse Pgp expressing LLC-PK1 cells could quantitatively predict the impact of Pgp on CNS distribution. Further evaluation with discovery and development compounds indicates that the impact of Pgp on CNS exposure can be predicted from in vitro transport studies within a factor of 3 for over 85% of discovery compounds (Figure 3). Most of the compounds falling outside the ability to predict Pgp's impact tend to be low permeability compounds, where a low proportion of transcellular transport relative to Pgp insensitive paracellular transport pathway result in underestimating Pgp efflux in the Pgp expressing LLC-PK1 cells. Thus with the exception of low permeability compounds, predictions of the impact of Pgp on CNS distribution in mice can be made from directional transport studies. Figure 3. Comparison of in vitro transport of drugs by mdrla expressed in LLC-PK1 cells with the impact of mdrla encoded Pgp on brain penetration in vivo. The in vivo impact of Pgp was determined from the ratio of the brain to plasma AUC values in mdrla -/- and +/+ CF-1 mice. 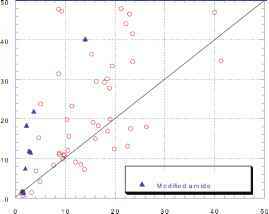 In vitro transport by mdrla was determined as the ratio of permeability coefficients for drugs in the B to A direction relative to the A to B direction in LLC-PK1 cells expressing mouse mdrla (L-mdrla cells). Parallel directional transport studies were performed in parental LLC-PK1 cells to ensure that observed transport ratios are not due to intrinsic transporters in the PK1 cells. Compounds showing three-fold higher impact of Pgp on CNS penetration in vivo than predicted from the in vitro transport are indicated by the closed triangles (▲), three fold higher impact in vitro than in vivo are indicated by closed squares (■), and comparable in vitro and in vivo values by closed circles (•). Although in vitro mouse Pgp can predict the contribution of Pgp to restricting brain penetration in mice, we would not expect mouse Pgp to extrapolate well to the impact on human brain penetration. Site-directed mutagenesis studies revealed that amino acid changes, particularly in TM 5, 6, 11, and 12 , produce functional Pgp with altered substrate specificity (Ambudkar, Dey, Hrycyna, Ramachandra, Pastan, and Gottesman, 1999; Ambudkar et al., 2003; Gatmaitan and Arias, 1993) . Comparison of sequences for mouse and human Pgp indicate 13% disparity in the two sequences including modification at residues in all the TMDs including those implicated in substrate interactions. 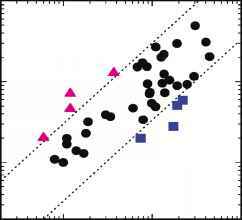 Thus it would not be surprising to find species-specific differences in Pgp transport. Indeed transport ratios in human Pgp transfected cells do not correlate well with the contribution of Pgp to the blood-brain barrier in mice. Comparison of transport ratios from human MDR1 and mouse mdr1a transfected cells is shown in figure 4a. While the majority of compounds show a linear correlation between mouse and human Pgp transport ratios, the ratios from the human and mouse Pgp differ by more than three-fold for approximately 20% of the compounds. 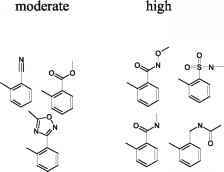 This species difference is seen to a various degrees in different structural classes of compounds and is influenced by very subtle chemical changes. In one structural series, modification to a single amide resulted in compounds which had very low human Pgp mediated transport, but retained extensive transport by mouse Pgp (Figure 4b). Thus very subtle structural changes can produce not only quantitative species difference in Pgp efflux but also qualitative differences in which compounds can be substrates in one species but not in others. Similar, species differences have also been observed over a wide range of chemical structures including prototypical Pgp substrates, and diverse compounds from a variety of discovery and development programs. Since our primary interest is predicting the impact of Pgp in man, the paradigm we apply to account for species differences is to establish the in vitro/ in vivo correlations in a chemical series with transport studies in mouse Pgp expressing LLC-PK1 cells combined with brain penetration studies in Pgp deficient and competent mice, and correct for species differences based on ratios observed in directional transport studies with human and mouse expressing Pgp LLC-PK1 cells (figure 5). Figure 5. Paradigm for predicting the impact of Pgp on CNS penetration of drugs in man. In vitro directional transport studies using mouse mdr1a and human MDR1 expressing LLC-PK1 cells are used to assess species differences in Pgp transport. In vivo studies in CF-1 mice are used to establish the validity of extrapolating the in vivo impact of Pgp from the vitro transport results. Figure 4. Comparison of in vitro transport of drugs by mouse mdr1a and human MDR1 expressed in LLC-PK1 cells. 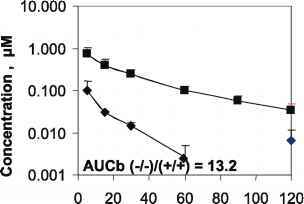 a) In vitro transport by mdr1a and MDR1 encoded Pgp were determined as the ratio of permeability coefficients for drugs in the B to A direction relative to the A to B direction in LLC-PK1 cells expressing mouse mdr1a or human MDR1. Parallel directional transport studies were performed in parental LLC-PK1 cells to ensure that observed transport ratios are not due to intrinsic transporters in the PK1 cells. 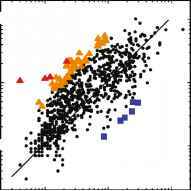 Compounds where the transport ratios are in general agreement (within a factor of five) are represented as circles. Compounds in which human MDR1 transport ratios are greater than 5 time the mdr1a transport ratios are represented as squares. Compounds with mouse mdr-1a transport ratios 5-10 or exceding 10 times the transport ratios for human MDR1 are represented as light and dark triangles respectively. b) Comparison of in vitro transport by mouse mdr1a and human MDR1 encoded Pgp for a chemical series. Modification of a single amide (▲) (see figure 8) resulted in loss of directional transport by human Pgp transport but not by mouse Pgp. Case study: establishment of Structure-activity relationships (SAR) to minimize Pgp efflux. 1) To identify structural templates with the lowest probability for Pgp transport when multiple structural classes of compounds are available. 2) To identify specific substituents in compounds which confer susceptibility to Pgp efflux, and determine structural modifications which reduce Pgp efflux while maintaining pharmacological potency. 3) Identify global physical chemical properties which confer susceptibility to Pgp efflux, and direct structural modifications to optimize these properties to reduce susceptibility to Pgp efflux. We have found that all three approaches have proven valuable in overcoming Pgp efflux when they are applied in context with other factors influencing drug-like properties. Our experience in one CNS program provides an example of the judicial use of structural relationships to develop CNS permeable compounds. In this program information from the Pgp susceptibility conferred by specific substituents (approach 2) was combined with evaluation of the global chemical properties (approach 3) to establish strategies to effectively overcome Pgp transport. It is important to note that although CNS penetration is an essential feature for a drug candidate in this program, good CNS permeability is only one feature to optimize, and structural changes to improve CNS penetration are of little value if they come at the expense of acceptable potency, selectivity, pharma-cokinetics, metabolism and safety. Figure 6. Influence of substituents on Pgp mediated transport. The influence of different functional groups was evaluated by comparing structural analogues which differ at a single position as described in the text. Although the absolute transport ratios for compounds were also dependent on other structural features in the molecules, comparisons between structural analogues showed that specific functional groups consistently conferred little or no influence on human PGP mediated efflux (low), showed a mild increase in Pgp efflux (moderate), or conferred a significant PGP mediated efflux (high). For example one structural series of compounds containing functional groups classified as low, moderate or high had transport ratios less than 2, 2-5, or >5 respectively.